A luminescent house brightens a block in Hiroshima, Japan. A glowing home in Japan has milky-white, one-and-a-half-inch plastic sheets wrapped around the exterior to let in light and provide insulation. Throughout the house, "Walls become windows and windows become walls," explains architect Makoto Tanijiri of the luminescent home he designed outside of Hiroshima with his firm Suppose Design Office. The owners, who are a couple with three children, requested a bright home with a gentle, pervasive light that is far from cold. 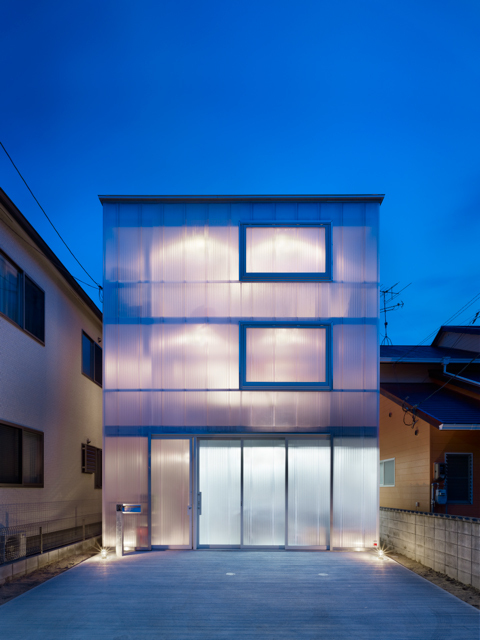 Thanks to its translucent envelope of polycarbonate plastic, the house glows like a firefly at night and is so bright during the day that resident Daisuke Tokuyama says he rarely turns on a light. The milky-white, one-and-a-half-inch thick polycarbonate plastic panels keep its inhabitants from being seen from the outside (unless they stand right up against the wall). From inside, urban surroundings become a pleasantly blurry backdrop. Daisuke Tokuyama told Japanese architect Makoto Tanijiri that he wanted a light-filled home for his family of five—a tall order, considering his narrow property in Hiroshima was boxed in on three sides. To creatively solve the problem, Tanijiri skipped conventional walls altogether and wrapped the entire three-story steel structure in polycarbonate plastic. “We were able to mix categories that are usually separate,” says Tanijiri. “Walls became windows and windows became walls.” Thanks to its translucent envelope, the house glows firefly-fashion at night and is so “superbright” during the day that Tokuyama says he rarely turns on a light. The milky-white, one-and-a-half-inch-thick plastic sheets provide other benefits, too. Tanijiri says they’re strong, easy to handle, and as effective at trapping warmth as double-paned glass. When temperatures rise in the summer, Tokuyama hangs reed shades to keep the upper stories from overheating. Residents can’t be seen from outside unless they stand directly against the walls. From inside, the less-than-scenic urban surroundings become a pleasantly blurry backdrop.